GAUSSIN MANUGISTIQUE® is specialized in the audit of handling processes, and the development ofwheeled handling systems used to install and transport heavy, bulky or fragile loads. With more than 50,000 vehicles worldwide, GAUSSIN Manugistique boasts a strong reputation in four markets with high potential: Energy, Transport, the Environment, and Raw Materials. As a creator of global handling solutions, we investigate each customer's needs on a case-by-case basis and invent new solutions to meet them. Our engineers design high-performance, towable or automated products. We realize prototypes, deposit patents, assemble modular elements. All this for a single purpose: find the solution to your handling problems. Our products are designed in the same way of objects: ergonomic, aesthetic, simple and safe to handle. 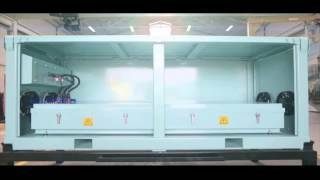 Henri Edmond GAUSSIN develops a workshop specialized in the manufacture of containers for the transport of spare parts for Peugeot. Creation of the current society. Henri Paul GAUSSIN transforms the workshop into a company specializing in the manufacture of steel structures and handling trailers. Christophe GAUSSIN takes over the management of the company and develops the Engineering area. Launch of the first motorized range of trailers and conquest of new markets such as nuclear power, shipyard, aerospace and steel industry with the development of the first customized and motorized vehicles. GAUSSIN refocuses its activities on its core businesses and high added value activities and begins the development of innovative solutions. OSEO awards the "Innovative Company" qualification to GAUSSIN SA. International commercial deployment of the ATT range of products. Official launch of the Full Elec ATM and award of the Innovation Award at the SITL trade show and the "Coup de Coeur du Jury" at the Manutetion trade fair. Creation of PAS (Port Automation System), Joint Venture with BA Systèmes dedicated to the automation of port terminals. Commercial launch of the Docking Station Straddle Carrier. Inauguration of the "Terminal Automatique Containers Henri Gaussin", a fully automated demonstration port terminal in the Guinottes area in Héricourt. Launch of the project "VASCO" (Supervised Automated Vehicle for Containers) which aims to develop the first 100% automated system without infrastruture modification for container horizontal transportation. Development of green and autonomous vehicles with navigation systems, ergonomics, design, standardisation, and modularity.